One of my favorite ways to spend a Saturday morning is to sit in bed, watching something on the history channel looking up new recipes to try. 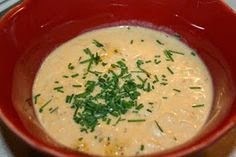 Recently I came across a recipe for she-crab soup and thought it looked delicious but could use a few more ingredients so I thought I would do some research on other she-crab soup recipes and create my own. Here is that recipe! Melt butter over medium low heat. Add chopped green onions (I didn't have green onions so I used a white onion and chives). Cook for about 4 minutes. Add flour and cook and stir for about 2 minutes. Stir in stock, milk, and cream. Bring to simmer. Add crab meat, sherry, salt, and pepper and heat through. I add a little more sherry, just cause I want to. Pour into bowls and garish with Paprika.